Smart Service is a landscape scheduling software that strives to optimize all aspects of your landscaping business. Since your existing customer information gets integrated into our software, there’s no lull till you can resume your normal business practices. Scheduling, dispatching, routing, monitoring your crews, invoicing, field estimates, and more can all be done with more efficiency and ease. Your busiest seasons can be just that: busy! 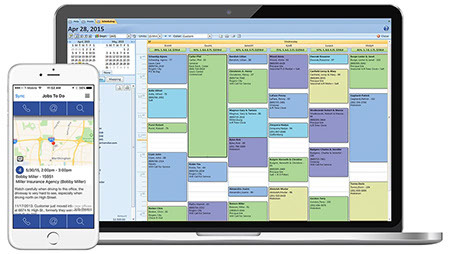 Smart Service landscape scheduling software uses a simple calendar view so that you can squeeze as much work into one day as possible. Optimize routing by sorting jobs via zip code when assigning them, or arrange them by job type. By looking at the hourly scheduling you can assign more jobs better than ever before without worrying about overlap or forgetting anyone. Smart Service is there to make sure you have an efficient and streamlined scheduling system to back you up. Forget about how you communicated with your teams before, Smart Service can elevate your dispatching. Your office can use GPS tracking to manage different teams and keep everyone updated via our mobile app. You can track how long each job took in addition to seeing the work order to review what each team did that day. The Smart Service mobile app also gives your team the ability to email or call clients en route to update them on specific arrival times. Keep your customers happy and your business optimized with Smart Service landscape scheduling software. Smart Service changes the way you deal with scheduling and streamlines the ability to change and add jobs. Check out our website to request a free demo of our landscape scheduling software! Elevate your scheduling game with some of our advice!